The Windows 7 installer looks identical to Vista at this time, granted this is a beta. Bootup times still seem average. 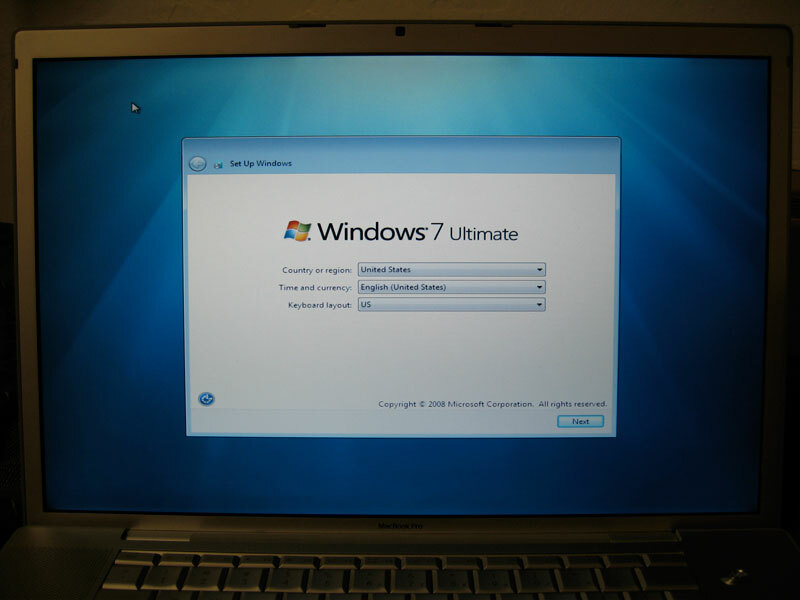 From a cold start it takes Windows 7 just over a minute to reach the login screen. Once the username and password has been entered it takes another 10 to 15 seconds to load the rest of the UI (judging by the wait indicator). The gadgets appear to be delayed and appear several seconds after the system is usable, so some progress has been made in regard to boot priorities. Here’s a short video showing the boot from a cold start. Sorry about the poor quality and background music, this was shot using my only camera, a point and shoot. Some noticeable improvements have been made in general UI responsiveness compared to Vista. My MBP, which has been known to get bogged down with Aero in Vista, remains snappy throughout my usage. This may be in part to the screen not dimming every 5 minutes with UAC asking for approval to continue. So far, all of my Vista applications are running just fine on Windows 7. All of the drivers for my MacBook Pro (2007 model) were automatically installed, including the wireless network card (except iSight). I don’t have ready access to Boot Camp drivers for 64-bit Vista so I don’t know if those will work or not. The hot keys to adjust brightness, volume etc. obviously won’t work without some drivers from Apple. The trackpad is also a little jumpy and lacks right-click functionality, but it is still usable. The task bar is by far my favorite feature in Windows 7. It’s a lot like the Apple Dock, where each application has a single icon. But Microsoft went a step further and added more intuitive window management. If you roll your mouse over any of the running applications in the task bar, a small window will appear with screenshots of the windows or tabs of that application. Rolling your mouse over any of those thumbnails will swap out what’s being displayed on your screen as a full-size preview. 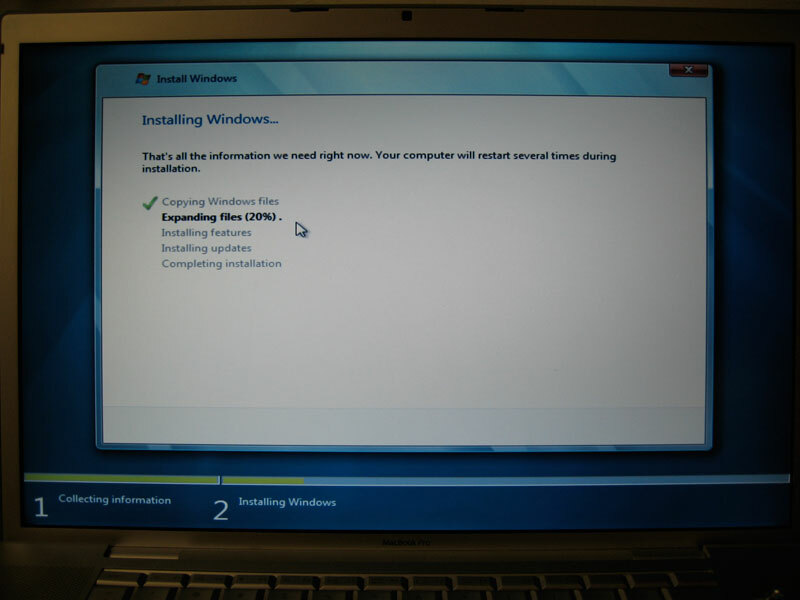 The Experience video on the Windows 7 beta website demonstrates this feature. 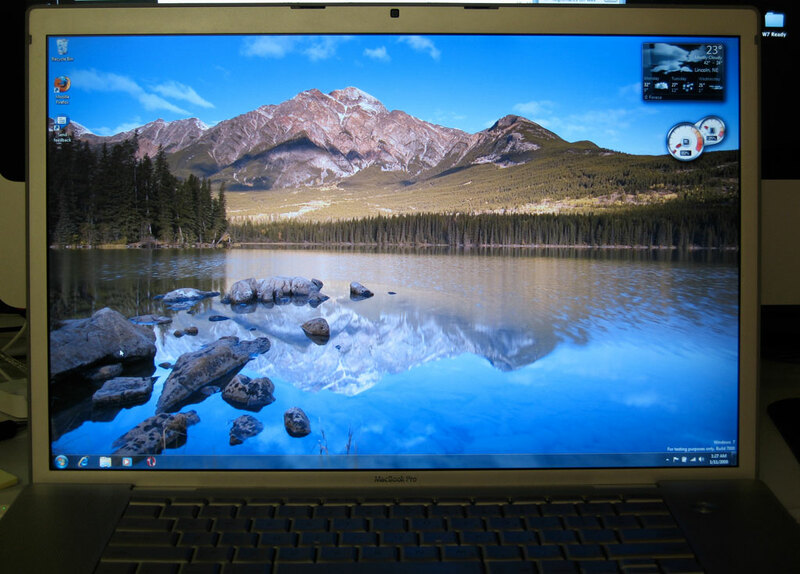 You need a little of my background — until the summer of 2007 I had never used a Mac before. I bought my MacBook Pro for the hardware with the intentions of running Windows as the primary operating system. I test drove Mac OS X Tiger for a week and came to enjoy using it so much that I’ve stuck with it since. A pro-Microsft friend asked if I was going to jump ship back to Windows with the recent progress. My answer … no. I’m a big fan of the Aero glass look, but Mac OS X has several little features that make using it more productive for me personally. Use the right tool for the job, and at this time Leopard seems to be the best fit for me. Do you think the upgrade will be worth it if Microsoft charges the same amount that they did to upgrade XP to Vista? Share your thoughts. 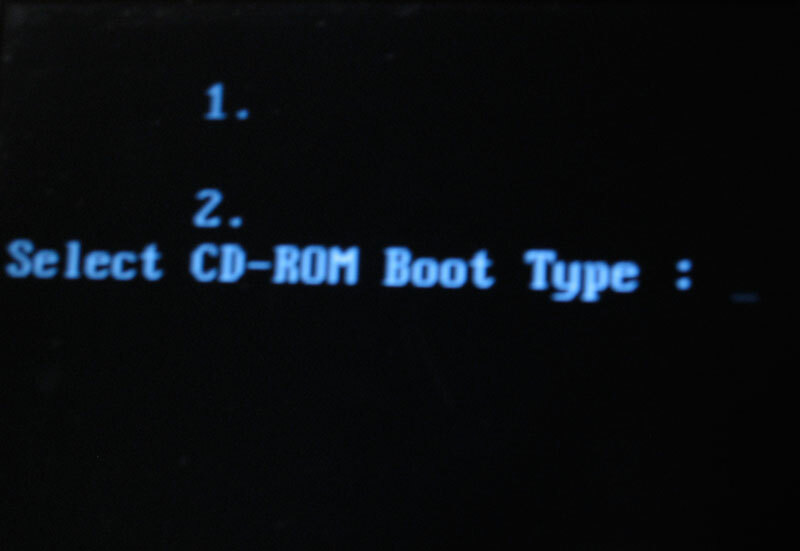 How do you get along the ‘ select CD-ROM Boot type’ problem?? Is it only possible to install first Vista x64?? Arend, I didn’t experience that problem, but I did start the installation from Vista. LINZC: Unfortunately no. I suspect we’ll get updated Boot Camp drivers later in the fall after it’s officially out. Sorry I can’t be of more help. I actually haven’t touched W7 since that installation. If you’re really hurting you might be able to find some modified touchpad drivers, or at least something that might give you a little more control over sensitivity. Hi – Did you ever figure out how to make the mouse less jumpy in windows? “The trackpad is also a little jumpy and lacks right-click functionality, but it is still usable.” I have the same issue when I use windows on my macbook….annoying. Thanks! If you would have asked me just a year ago how I felt about Apple I would have said, “I hate there cheeky products and all the fan-boys that follow” I began working with a mac because my roommate bought a new iMac, shortly after I ditched my PC that I built (the tower of pure awesomeness) and bought a MBP… then a Mac Pro… then an MacBook for my girlfriend. Anyway, my point is that I develop on a Mac all day, deploy Rails apps, manage 3 servers, design iPhone apps, and use CS3 all on a mac, and enjoy the experience far more than I did on my PC.